Start testing apps on the HbbTV / Freeview Play platform within a couple of minutes. CandyBox - plugged in and configured. CandyBox should have the status online in your control units. Set up Suitest channel broadcasting - broadcast the Suitest channel using your playout stack. Configure the device to be on the same local network as the CandyBox. Contact your friendly network admin if you require assistance. Set up your device so that it has a sight line to the CandyBox that will be controlling it. Attach the IR blaster to the device, follow attaching the infrared blaster guide if needed. Be careful with the placement of the IR blaster to avoid issues further on. Gather the Manufacture name, Device model name, firmware version, local IP address and Suitest channel number. The location of the device details depends on a device basis, if necessary consult your device's user manual. The IP address of the device should preferably be static. 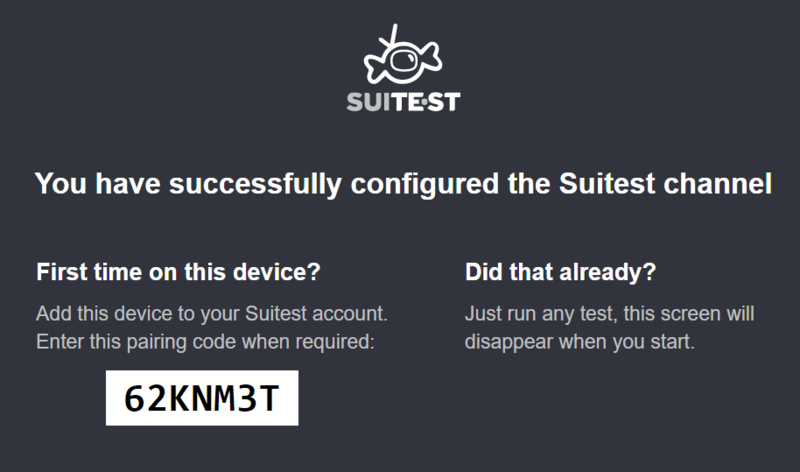 Set up the HbbTV / Freeview Play device, by adding it to Suitest. In Suitest open devices, then Add device > Add physical device > Select the HbbTV / Freeview Play platform. Fill in the details that you have previously noted down. Assign the device driver by selecting the controlling emitter (the CandyBox and IR blaster that will control the device). Then select or record the device driver, follow the instructions in Suitest or refer to select or record device driver section if needed. After pressing Next the device will be added automatically. Highly recommended to create a boot sequence to automatically switch to the Suitest channel every time test execution starts. Add new configuration - name it, change the platform to HbbTV / Freeview Play. Add a URL of the app you wish to test on App details, for this guide let's use http://file.suite.st/demoapp/hbbtv.html which is a Suitest sample app. Leave the rest of the configuration in it's default state. Once connected the VRC will be shown on the right side of Suitest. To check that you are connected correctly you can press some buttons on the VRC and you should observe some changes on the device's screen. In this quick start, we will be testing if the user can navigate to and play a video within the WatchMe Demo. Now, switch to Search by property tab. Search for the element with the :nth-child(3) > :nth-child(2) > div CSS selector and save the element. Navigate to the Test Editor and let's create a test for our scenario. In this scenario we will use the wait until, video assertions and press test operation. Make sure the video is playing on your device, to allow Suitest to automatically capture information about its state.